It’s not that I’m tired of all the talking. If I didn’t like talking in anime I would have dropped the franchise long ago. But Owarimonogatari 10 is the second week in a row where a lot of talk can be wearying. I suspect it’s because Gaen is doing all the talking and she has an answer for every question and is a little smug about it. One of the reasons Ougi also gets on my nerves. In this episode, through much of it, anyway, she explains why the “first one” managed to revive himself at that shrine, and it’s somehow all Araragi’s fault. The fault seems to lie in the fact that he happened to be there, or at least did something quite innocently; nonetheless it’s his fault, Gaen says, so naturally Araragi accepts it and goes off to buy a BL book for Kanbaru and donuts for Shinobu, whereupon, to my relief. the episode gets cheerfully silly again. The First One showing up in the guise of a young boy was another welcome, quirky moment, welcome after all the one-sided talk. In One Punch Man 9, like Genos, I’m not sure what Saitama was thinking when he turned to the crowd and joked about the other heroes softening up the sea guy so he could he could polish him off and take all the credit. He was being sarcastic, maybe, bitter about the bad rep he’s acquired, or he’s being diplomatic, or he just doesn’t care. Probably all of them in measure. He’s already made it clear that he isn’t in this business for glory or fame, though he wouldn’t mind a nice fan letter or two. His reaction to the hate mail was telling: someone with a lot of free time. The crowd response isn’t important to him, at least not superficially. I also admire the honest way he deals with the other heroes: if they’re shits like the Tank-Top guys he responds. Otherwise he sees them as other folks in the same field, and likes the ones who try hard, like Mumen Rider. 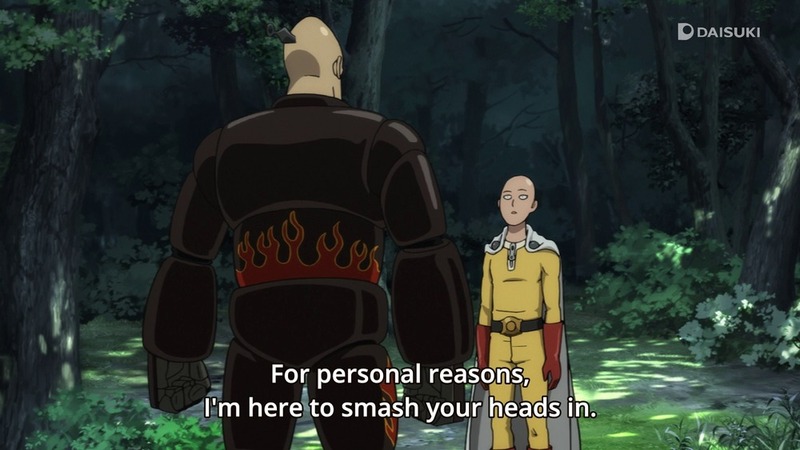 We need more superheroes like Saitama. And in #10 they have to bring up a new villain. Fortunately Saitama invited himself to the briefing so, unlike last time, he’ll be around right away to help stop the carnage, if the rest of the S-class heroes will stop bickering, that is. Well, that’s unfair. The other heroes are all strange people, as you would expect, but they’re not all pampered superstars, and I frankly can’t think of a time when any of them backed down from a fight. They’re individuals, with their own personalities and occasional petty jealousies. They’re also doing a pretty good job with the current threat. So, like Saitama, we’re all hoping the boss will show up next week and get this threat over with. Rakudai Kishi no Cavalry 10 features the Shizuku/Touka fight. It goes along predictable lines, but has some nice moments. Shizuku cleans off the blood. But it’s a good battle anyway. We’re told, for perhaps too long, that Shizuku needs to follow Ikki, and so she desperately needs to win this battle against the girl who single-handedly kicked all those monsters’ asses last week. That brings up another point: Touka is not an evil opponent, but an ally. It’s one of those battles where you really don’t want either to lose. The battle itself looks great. Like last week, the show uses another simple trick, having Touka in the distance and in the next frame be right in front of Shizuku, swinging her sword. Simple and well-timed. In the couple times the show did it, we don’t expect it. Neither, sadly, does Shizuku, who finally goes down after her last-ditch flurry fall short. Still, well done! Ikki says she’s become strong, but to me she was as strong before the battle as after it. Gakusen Toshi Asterisk has a lot of battling, too, but they’re content to show us earlier matches and let some comedy in. Yay you. Now put on some clothes. But first they introduce Irene by having her beat up some thugs and get intimidating with Julis and Ayato … and then bring down her threat level considerably by introducing her more proper sister, Priscilla, who wears the pants in the family, it seems. I wonder what Priscilla thinks of Irene being incarcerated, or was she incarcerated too? Anyway, we move on to Saya and Kirin’s match and the nakedness following, and yet another magic battle academy series uses the “If I rub them they’ll grow bigger” trope, two in a row. There’s also head-patting later. Ayato/Julis’s next round is also a laugher. They save the crazy stuff for the Irene/Priscilla match against MacPhail/Fat Kid. It ends the way you expect, MacPhail being a cannon-fodder character in this series, but he does land some good shots and forces Irene to recharge by going vampire on her sister. So we learn she can be roughed up and perhaps taking care of the sister first would be a good idea. Well, Lester tried that … I liked the idea that her magic weapon made augmentations to her body so that she tap into her sister, so she’s technically a vampire, but not, you know, undead or anything. Anyway, they do look a lot more formidable than they did in the first scene. Comet Lucifer 8 goes from blood death and getting slaughtered to happy la-la new-agey unicorn lands without the unicorns. For the former, we have lots of flashbacks of Do Mon. We know he was a grizzled soldier and allies with Gus, and now we know he used to watch over Sougo’s genius mother and obviously had a thing for her. Then we see her get blown up by bad guys, and next week I assume we’ll see him adopting Sougo. So there’s a grimness to him that makes him slug Sougo when the boys insists on protecting Felia, and that leads us to the la-la bit. Moura and Sougo make a pact to protect Felia and so Sougo gets a hippy view of the universe and Felia’s part in it. I’ve actually heard theories about life on Earth based on Moura’s story, that is until he gets to the part about one person being the living embodiment of a planet. There’s a perhaps unintended contrast between Do Mon’s role of the mom’s protector, and the role that Sougo is taking up now. Maybe Do Mon shouldn’t have hit him so quickly. One Punch Man 8 is the first where the annoying consequences of the premise overwhelmed the episode. As I’ve said before, maybe, the big gag of the series is Saitama throwing his punch, which takes all of a second unless he has some ground to cover. The rest of the time is spent with the bad guys posturing and the other good guys posturing and getting beat up until Saitama gets there. This week we had some fish-king villain, nothing terribly exciting about him, and some new heroes like Puri-puri Prisoner with their schticks that got old long before the episode ended. Meanwhile, Genos and Saitama run around looking for the action, and I began to drum my fingers… And then I got seriously pissed off when the episode ended and Saitama still wasn’t there. And even though Genos did, there was no time for him to fight before time ran out. This show doesn’t have the setup to sustain a two-parter! What were they thinking? Sakurako-san 8’s arc conclusion gave us a nice though not unprecedented twist, but the delivery wasn’t terribly interesting. Shoutarou and Sakurako go and deliver Sasaki’s effects to her sister, Sayuki, who, getting into the morbid spirit of bones along with Sakurako, is disappointed that there wasn’t baby bones added to it. They find the baby bones quickly enough, and with a lucky circumstance involving toes, unravel more of the mystery, which was more of a regrettable and melancholy series of events and memories than a crime, all of it conveyed by talk. So not terribly interesting to watch, though I’m relieved Sakurako didn’t do her transformation sequence this time. As for that guy in the hospital, it was unrelated to this story unless it has something to do with those two cats. About the only notable thing this week was Shoutarou using some solid insight about them; even Sakurako was impressed. 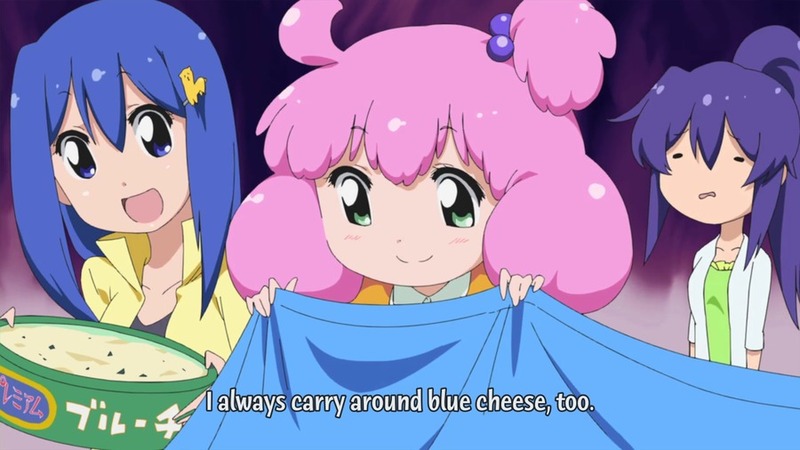 Teekyuu! 68 retells the Cinderella tale with Yuri as Cinderella. Three guesses as to who played the rich stepsisters, all 245 of them. Not bad. SPG ratio of 2.0, and there might have been some visual gags I missed. Felia goes all yellow on us. Good or bad? It hardly feels worth it to talk about One Punch Man 7 so long after the episode aired … The first half had the same basic flaw that the show often has: we’re just waiting around looking at the threat until Saitama decides to throw a punch. Not that funny this time, as Genos isn’t terribly funny unless there’s some irony to what he’s saying or he had Saitama around to comment, and the Bang, the old guy, was too busy acting like the senior dojo guy he is. The second half, where the uncomprehending and ungrateful crowd get egged on to harass Saitama was better, though it went on too long. I wanted to know how Saitama would handle it, and I didn’t expect basically a “piss off!” from him. 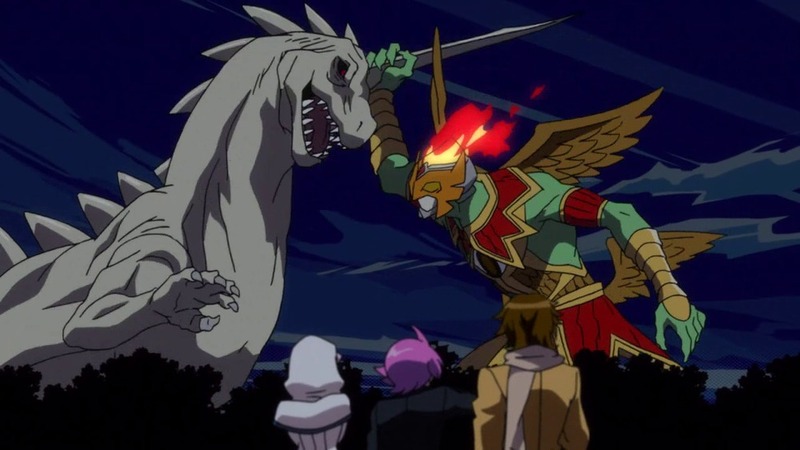 But it’s hard to say if these bones are the multi-episode arc’s focus, or the spark to another mystery. Also, there are weirder-than-usual things going on in Sakurako’s head. After letting poor Shoutarou know that she removed the bones from a cat she had and put them on display, we get the idea that perhaps the old teacher, Sasaki, had much the same idea with the human bones they found, that of an old housekeeper. But before we can make anything of that connection the story shifts to Sakurako at a hospital bed, getting permission to work on an unsolved case from Masamichi, the person lying there, someone we don’t know about. Again, we don’t know if the mysteries are related or that Sakurako was prompted by the discovered bones and some buried emotions to investigate another mystery. And the show isn’t about to tell us this early. Ho hum another weird battle. Concrete Revolutio seems to be aiming for a single big story made up of all the little things they casually toss in each week, but frankly the little things are just piling up and not building the structure they need for it. Part of the problem is the time hopping. Tossing in a quick date isn’t enough to give us a firm footing as viewers, and the events after date goes off the screen don’t really help. Jiro doesn’t have super powers, then in another time he does. Who’s side is he on this week. Same with the detective. And while all this confusion may make the show fun to watch for some viewers, the rather bland stories of the week, with their hackneyed, overused little morals (this week it’s “Beasts are people too,” or something like that) don’t live up to the setup’s possibilities. The only thing that I really liked this week was the guy raising beasts exclamation that beasts are an expression of our anger. I could argue the same about any giant monster tale coming out of Japan, and if I did I would be grossly oversimplifying things. But it’s refreshing to hear a character say it. One Punch Man 4, not much to say, except that the two bad guys fought each other before they had the misfortune to meet Saitama. This meant we had to put up with speeches and posturing from both men in the same battle, and wait for Saitama’s trademark battle cries such as “there you are,” “huh,” and “oh, really?” later. Not that I’m mocking him. His low-key approach to the verbal battle stance is a great response to the shouting and boasting the opponent does and one of the funniest things in the show. Too bad they had to baddies fight each other first, because we had to wait for our fun. Next week, Saitama joins a hero registry. I can’t help doing a quick mashup of Concrete Revolutio and OPM in my head. Would he work for Jiro’s organization? Teekyuu! 64 features their annual hanami session, though they’ve actually never done it before. There’s badminton, an old man, and a guy named Gomez. SPG of 2.7–excellent, and I probably missed a joke or two.